At One Awards we believe passionately in advancement through learning. To that end we would be delighted if you could join us in our Celebration of Learning and AGM event at The County by Thistle, Newcastle upon Tyne on Friday June 12th from 9.30am.We will be celebrating the amazing achievements of our recognised centres and learners and we also offer a fabulous line up of guest speakers. Dr Richard Spencer, Head of Science at Middlesbrough College and Britain’s only representative at the finals in the inaugural Global Teacher Prize held in Dubai. One Awards Update – future plans and opportunities. The Home Achievement Programme – Launched in 2008 as a pilot in the North East, this One Awards programme is now delivered nationally with over 140 project groups taking part in the delivery. 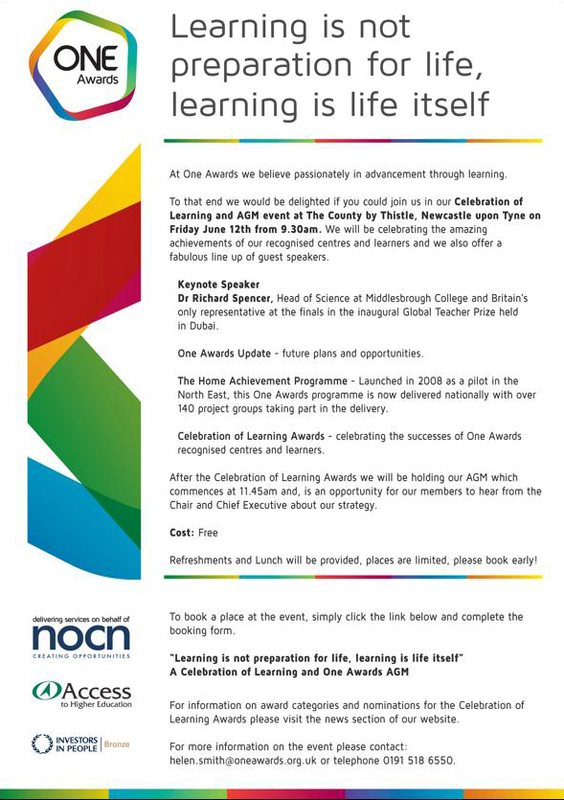 Celebration of Learning Awards – celebrating the successes of One Awards recognised centres and learners. After the Celebration of Learning Awards we will be holding our AGM which commences at 11.45am and, is an opportunity for our members to hear from the Chair and Chief Executive about our strategy. To book a place at the event, please click here. For information on award categories and nominations for the Celebration of Learning Awards please click here.